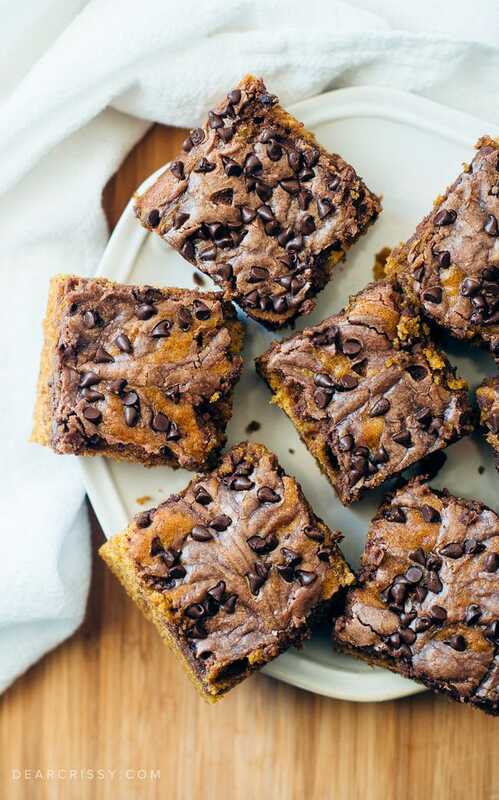 Once again I’ve consulted my favorite seasonal magazine, the Better Homes & Gardens Fall Baking 2015 edition, and this time I’ve really struck pumpkin-gold with these delicious chocolate-swirl pumpkin bars! I mean just look at these babies! I’m sure I’ve mentioned it before, but I’m one of those people who go crazy for pumpkin recipes this time of year. From pumpkin cookies to a hot pumpkin latte, I just can’t get enough. I love these easy chocolate-swirl pumpkin bars because they are easy to make and are a great choice for when you need to take a sweet dish to a holiday gathering. 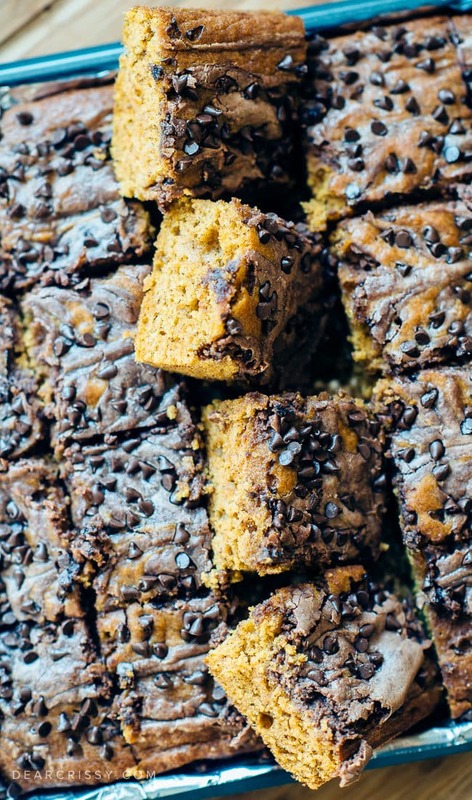 They are like a cross between a pumpkin brownie and pumpkin cake, and those chocolate chips encrusting the top of these bars really puts them over the edge. 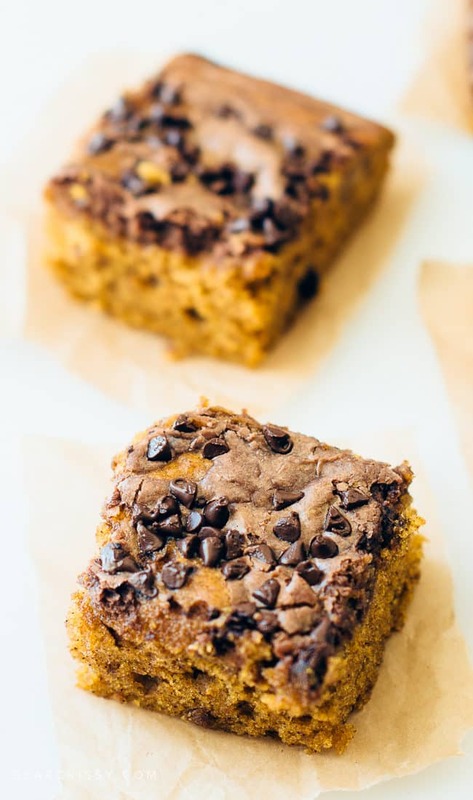 This is also one of my favorite pumpkin bars recipes because it’s not overly sweet meaning you don’t feel like you need to go lie down after you eat one, though you may feel that way after three, haha! 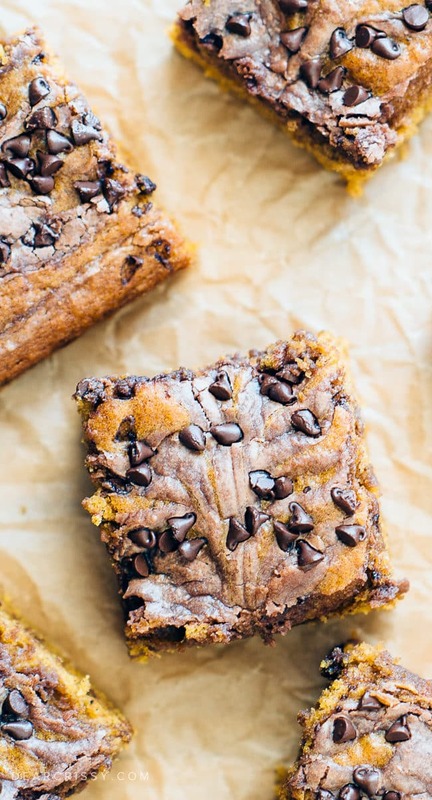 These pumpkin bars also look just gorgeous. When I put them in the oven to bake I was skeptical that they would turn out like the picture in the magazine. 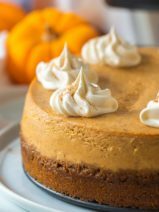 The marbling sort of blended together when the batter was wet, but as the bars baked, that rich pumpkin color began to reveal itself in contrast to the chocolate swirling. 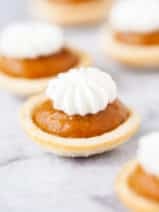 This pumpkin dessert is really quite lovely and something that you can be proud of. 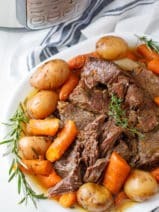 I would definitely recommend following the tip about using the foil in the pan and lifting the bars gently out of the pan on the foil to cut them. You also want to make sure the bars are quite cool before you cut them and even then you will probably have to wipe your knife between cuts. That’s okay, these bars are gorgeous even with a little crumbly imperfection. 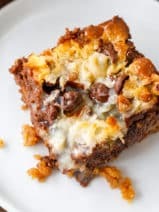 Be sure to leave a comment if you adore this chocolate-swirl pumpkin bars recipe, and be sure to follow me on Pinterest for even more pumpkin recipes this season. 1. Preheat oven to 350 degrees. Line a 15×10-inch baking pan with foil, extending the foil over the edges of pan. in a large bowl stir together the first seven ingredients (through cloves). Add the four eggs, the pumpkin and oil; stir until combined. Spread batter into the prepared pan. 2. Microwave 1/2 cup of the chocolate pieces for 1 minute of until melted, stirring after 30 seconds; set aside. 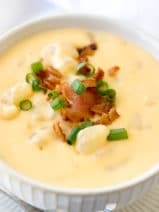 In a medium bowl beat cream cheese and the 1/3 cup sugar with a mixer on medium until combined. Beat in the one egg, the milk, and the melted chocolate. Spoon cream cheese mixture in mounds over pumpkin bater. using a thin metal spatula or table knife, swirl to marble. Sprinkle witht he remaining chocolate pieces. 3. Bake 25 to 30 mintues or until puffed and a toothpick comes out clean. Cool in pan on wire rack. using the edges of the foil, lift uncut bars from pan. If bars are too soft to cut, freeze for 1 hour). Cut into bars, wiping knife between cuts if needed. To store: Place bars in a single layer in an airtight container; cover. Store in the refrigerator up to 3 days. Recipe via the Fall Baking issue of Better Homes & Gardens. Made this for Thanksgiving and it was a hit! I am not a fan of foods that taste a lot like pumpkin, but this was the perfect amount – and especially with the mixture of chocolate and cream cheese. I loved how easy this was to make too. 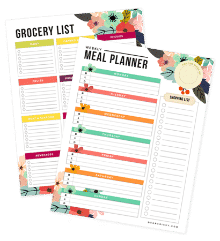 I am going to make again for my department holiday party – thanks! I just made these. They are really good and easy, but we didn’t think we could tell there was chocolate in the cheesecake batter. You can definitely taste the chips on the top. 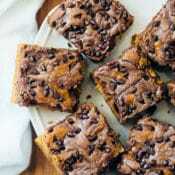 I think next time, I’ll try it without adding the metlted chocolate and sprinkling the chips on top. The pumpkin cake is very good and could be made by itself with a cream cheese frosting. Thanks for the recipe. I will definitely try them again. Your photos are beautiful. 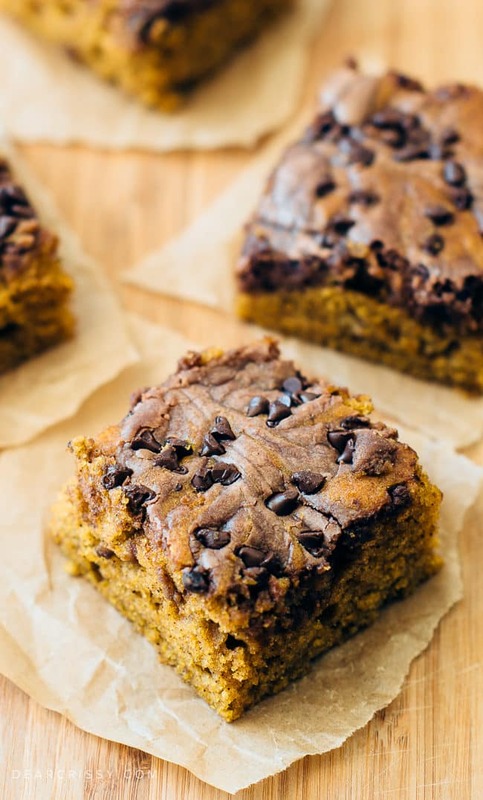 Love these bars – anything pumpkin I could seriously fall head over heels for!! and these photos are gorgeous! These look so delicious!!!! I will be making these soon.